Sonchai Jitpleecheep—the brash and beguiling Royal Thai Police Force Homicide Detective who has been the narrator through John Burdett’s five previous acclaimed Bangkok novels—is back. The former monk and devout Buddhist, forever battling to protect his karma from the assaults of morally compromising cases, is now faced with the most horrifying technological innovation to make its way to the streets of Bangkok and a conspiracy of almost unfathomable reach. Sonchai is at his desk in District 8 Police Station when he gets word of a body being found not too far away. A few streets, in fact, in the market area. As the only homicide detective at the station, he has no other choice but to investigate, never realizing what a can of nightmarish worms he’s about to open for himself and his troubled past. When he arrives at the scene, despite the horrors he has encountered over the years, little prepares him for what awaits: the decapitated body of a young schoolgirl, the head seemingly pulled off the rest of the torso by sheer physical force. Bizarrely, the face is unblemished, not a mark to indicate the horror the rest of its body had to endure. Why has Sonchai’s obsessive search for his unknown biological American father been brought into this? A red herring? Or something sinister? How many people even know of Sonchai’s searching? Could the killer actually have connections with Sonchai or his family? Teaming up with Sonchai on this case is a young female inspector by the name of Krom. Like Sonchai, she’s an outsider on the police force, but unlike him, she is socially savvy and a technological prodigy. When they’re called to a clandestine demonstration—in the midst of a typhoon—of the deadly, superhuman strength of an American man who is seemingly controlled by a CIA operative, they have no idea what they’re actually witnessing or why. Could the Americans have figured out a way to create a physically and psychologically enhanced supersoldier? Are they testing him—or it—on Thai soil? And why is everyone, from the Bangkok police to the international community, so eager to turn a blind eye? To add to the surreal scene, before his very eyes Sonchai witnesses a double murder. Two men in a boat each throwing a woman into the raging torrent of the Chao Phraya River, mercilessly allowing their victims to drown. More shockingly, it later transpires that the killers and victims are related: mother and wife. Searching for the answers to these questions, Sonchai and Krom find themselves in a remote Cambodian jungle compound for aging American ex-soldiers, where they will discover just how far a government will go to protect its worst secrets—both past and present. But the case will also have much more personal repercussions for Sonchai, shaking his world to its very foundation and perhaps finally forcing him to confront his long-lost American father. 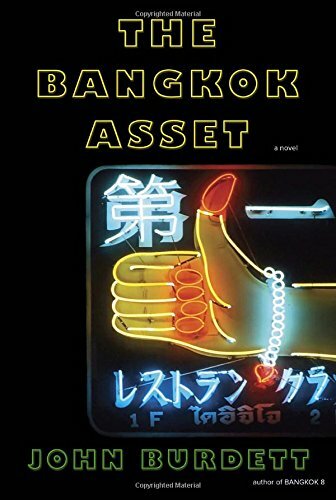 Bangkok Asset is an intelligent, high-octane psychological thriller from a master storyteller at the top of his game, chilling at times but with the right balance of dark, sly humor. Detective Sonchai Jitpleecheep is a class act.